Supporters of former South Korean President Park Geun-hye weep to demand her release as a bus carrying her arrives at the Seoul Central District Court in Seoul, South Korea, May 25, 2017. South Korea’s young democracy was tested with the recent impeachment of ex-President Park Geun-hye. Now the rule of law is on display as the disgraced leader stands trial on criminal charges related to the corruption scandal that forced her from power. The National Assembly resolution to impeach Park in December was based largely on allegations that she colluded with her longtime friend Choi Soon-sil to extort Korean conglomerates to donate more than $69 million to two dubious foundations. In upholding the impeachment vote in March, the Constitutional Court clarified that its ruling was based on the legitimacy of the legislative process to oust the chief executive, and not on the criminal guilt or innocence of the defendant. Park is the first elected leader to be removed from office in South Korea since democracy was established in 1987. South Korean ousted leader Park Geun-hye arrives for her trial at the Seoul Central District Court in Seoul, May 25, 2017. On Thursday, the former president returned to court in handcuffs for the second day of her trial. Prosecutor Lee One-seok called this first criminal trial of the impeached president both historic and unfortunate during the first hearing Tuesday, and said it “demonstrates the firm establishment of the rule of law.” Park stands accused of 18 crimes related to the impeachment scandal including bribery, and has been held in prison for weeks while awaiting trial. During the impeachment process, Park’s defense strategy to stall, evade and refuse to cooperate undermined her case with the Constitutional Court that criticized these tactics as attempting to prevent the legislature from acting as “check and balance” on executive power. But in a criminal trial where the defendant enjoys a presumption of innocence and the burden of proof is on the prosecution, this same strategy could work to Park’s benefit. “Prosecutors need to prove it is true and based on evidence without reasonable doubt. So President Park does not have any reason to prove herself innocent,” said Lee In-ho, professor of law at Chung-Ang University in Seoul. 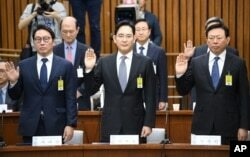 SK Group chairman Chey Tae-Won, left, Samsung Electronics Vice Chairman Lee Jae-yong, center, and Lotte Group Chairman Shin Dong-Bin take an oath during a parliamentary probe into a scandal engulfing President Park Geun-hye at the National Assembly in Seoul, South Korea. Park could face more than 10 years in prison if convicted of taking bribes and coercing major Korean conglomerates, including the Hyundai Motor Group, the Lotte Group and the Samsung Group, to donate millions of dollars to nonprofit cultural and sports foundations being operated by her friend Choi. From the Samsung Group leader, Jay Y. Lee, she is accused of taking $26 million to get government approval for a multibillion-dollar merger. Park has publicly stated that she never benefited financially from public office, and that she acted in the national interest by soliciting corporate leaders to fund foundations to export Korean culture and to make Korean athletes more competitive at international events. Unless the prosecution can prove that Park directly received bribes, it will be difficult to connect her to a crime based solely on the corporate donations made to the foundations. “If it is proven to be a bribery crime, then it would mean a president cannot work on the establishment of foundations for the public interest, so it is questionable to me,” Lee said. Choi Soon-sil, the jailed confidante of disgraced South Korean President Park Geun-hye, arrives for questioning into her suspected role in political scandal at the office of the independent counsel in Seoul, South Korea, Dec. 24, 2016. The ex-president’s confidante, Choi Soon-sil, may be more exposed for more directly being involved in the financial dealings. The court has combined Choi and Park’s cases. Choi broke down in tears in court Tuesday. She defended the ex-president as someone “who devoted her life to the country” and called herself a “sinner” for putting her friend of 40 years in this situation. Outside the court, a crowd of Park’s supporters held rallies to condemn the trial as political persecution and to demand her release. Following the ouster of the conservative leader, South Korea in May elected liberal President Moon Jae-in, who has promised to crack down on corruption and corporate misdeeds.